One Leg Up plays acoustic swing dance music and Gypsy Jazz in the spirit of Django Reinhardt. They are great for dancers as well as providing lovely background music. When they play acoustic it is the same elegant effect as produced by a string quartet. 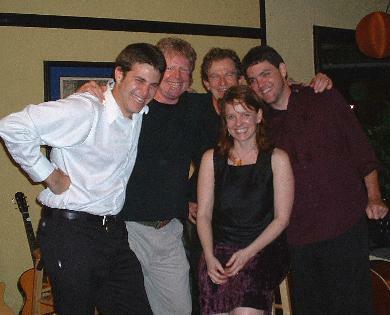 The group plays for many fine affairs and elegant weddings. Their show can range from subdued atmosphere to a rip roaring swing dance. Jazz fans appreciate this band for their great musical talents and improvational skills. Acoustic music fans appreciate the fact that the band uses all acoustic instruments. Swing dancers love the beat and fast pace that this band can provide. The vocalists do a great job of reproduceing the vintage jazz songs that the group performs.